Demonstrators were of the view that the wave of bombings and target killings is the direct result of American foreign policy. America is notorious in the world for her support of low intensity conflicts and secret “Black Operations”. The purpose of such chaos in Pakistan is that Pakistan military should target those tribal fighters who are crossing the border with Afghanistan to fight the American occupation in Afghanistan. To end this war of Fitna between the armed forces of Pakistan and tribal Muslims, it is necessary that this region must be purified of the American presence. Demonstrators were demanding from the Pakistan army to mobilize and close the American embassy and expel US diplomats, military and intelligence personnel as well. 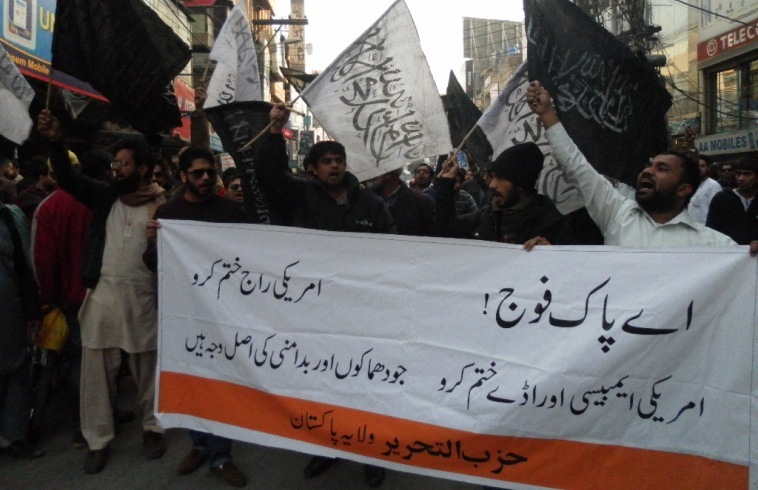 Demonstrators were also demanding from the sincere officers of the armed forces that they must provide Nussrah to Hizb ut-Tahrir for the immediate establishment of the Khilafah. The Khilafah will then mobilize both our armed forces and tribal fighters without delay to strike at America's presence in the region in a way that will strike fear in their hearts, scare the Shaytaan out from their beings and smash their ambition against this Ummah to smithereens.